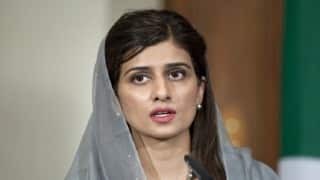 Hina Rabbani Khar is a Pakistani stateswoman and is most popularly known for her tenure as the foreign minister of Pakistan. She was the 26th Foreign Minister of Pakistan and she held this position from February 2011 to March 2013. She is also the youngest person and the first woman to hold this position. She entered politics in 2002 and became the junior minister and was responsible for economic policy under Prime Minister Shaukat Aziz. Currently, she is a member of the Pakistan’s People’s Party and is a public speaker on foreign policy. Born on 19thNolvember 1977 in Multan, Punjab, Pakistan, she was born into a feudal Muslim Jat family and is the daughter of the famous politician Ghulam Noor Rabbani Khar. Her father was the member of National Assembly. She is also the niece of the former Governor and Chief Minister of Punjab Ghulam Mustafa Khan. With such a political background, she also became a politician. She is a graduate of Lahore University of Management Sciences and she holds the BSc in Economics. She subsequently attended the University of Massachusetts at Amherst in the United States where she earned MSc in Business Management in 2002. She stepped into politics at the young age of 24, her advent made necessary by circumstances. In 2002, her landowner father could not contest elections because a new law required all candidates to hold university degrees. He didn't have one, but daughter Hina did and she was elected as the MP from Muzaffarnagar II. By 2005, she was a junior minister.in 2007, she made an unsuccessful attempt to renew her alliance with the PML-O but later the party denied her a ticket for re-election in 2008 and she was subsequently invited to join Pakistan People’s Party and she successfully campaigned for her constituency for a second time. 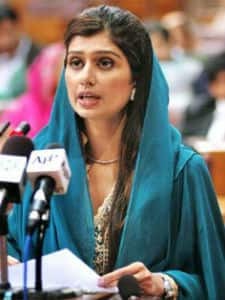 In 2009, Rabbani Khar, as Minister of State for Finance and Economic Affairs Division, became the first woman ever to present Pakistan's Finance Budget. She also worked on reducing Pakistan’s circular debt within the energy sector. 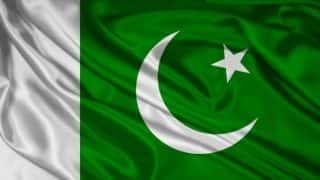 In February 2011, MsKhar became junior minister for Foreign Affairs and in July last year, she took over as the Federal Minister, the youngest and first woman foreign minister in Pakistan. While appointing her, MrZardari said it symbolized his government's commitment to bringing women into the mainstream of national life.Soon after her appointment, MsKhar visited India and dazzled people as much with her refined oratory as her with her appearance. Much newsprint was devoted to her partiality for Birkin bags and pearls, her views on Indo-Pak ties somewhat lost in the bargain. During her two yearlong appointment as the foreign minister, she attracted several global attention and was served by CBS News, Washington Post among others. She also served as a high ranking member of the Central Executive Committee of Pakistan’s Peoples Party from 2008 until 2013. Since standing down, Khar has been an active public speaker. In an interview with Al Jazeera in December 2015, she accused the US government supporting military regimes in Pakistan. She has written op-ed's for Newsweek Pakistan and was interviewed by Mehdi Hasan at the Oxford Union in December 2015. In June 2016, she appeared on Jirga with Saleem Safi speaking out against Pakistan's aggressive stance in the Kashmir conflict. In an appearance at the Islamabad Literature Festival, she continued her support of a closer Indian-Pakistan relationship.